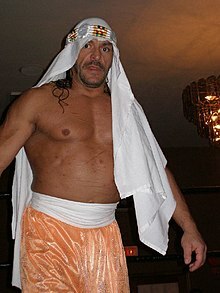 1Sabu's first reign occurred while the promotion was an NWA affiliate named Eastern Championship Wrestling, and was prior to the promotion becoming Extreme Championship Wrestling and the title being declared a world title by ECW. Sabu held the title again after these events. ↑ 1.0 1.1 1.2 1.3 "Sabu's WWE alumni profile". WWE. สืบค้นเมื่อ August 10, 2012. ↑ "Breaking News! Last Night Sabu, rush to the ring during the finals of heavyweight tournament and shocked Billtown USA, when he became the first ever BCW champion!". Facebook.com. Billtown Championship Wrestling. May 23, 2016. ↑ 4.0 4.1 "Sabu: Titles". cagematch.net. ↑ Larry Csonka (2009-06-28). "Legends of the Arena Results 6.27.09". 411mania.com. ↑ Meltzer, Dave (2013-11-13). "Wed. update: New Rock movie, Great TV show, Cornette podcasts, TNA PPV matches, Hogan on OWN, Tokyo Dome show, Star of Raw, Eddy Guerrero, Tanahashi, DiBiase and original UFC". Wrestling Observer Newsletter. สืบค้นเมื่อ 2013-11-14. ↑ "Pro Wrestling Illustrated Top 500 – 1995". Wrestling Information Archive. สืบค้นเมื่อ 2010-09-15. ↑ "Pro Wrestling Illustrated's Top 500 Wrestlers of the PWI Years". Wrestling Information Archive. สืบค้นเมื่อ 2008-08-05. ↑ "Independent Wrestling Results – October 2002". Online World of Wrestling. สืบค้นเมื่อ 2008-07-06. ↑ Droste, Ryan (2006-01-15). "Impact! Results – 1/14/06 (Christian & Rhino vs. AMW, Sting is heard)". WrestleView. สืบค้นเมื่อ 2012-06-20. ↑ "United States Extreme Wrestling title histories". Wrestling Information Archive. สืบค้นเมื่อ 2010-09-15. หน้านี้แก้ไขล่าสุดเมื่อวันที่ 22 มีนาคม 2560 เวลา 13:07 น.